Operator friendly, the Aquabilt Underwater Treadmill is totally powered by the user. As much or as little effort desired may be expended and still sustain maximum workout benefits. The speed can be varied by the user either by slowing down to a leisurely stroll or by speeding up to a running or jogging tempo which provides higher resistance for a serious workout. Walking on an Aquabilt Underwater Treadmill allows the user to fully exercise ALL the muscles of the leg, both front and back; whereas, traditional pool water walking exercises the front leg muscles only. This is because when the heel strikes the pool bottom, the surface is stationary, as compared to the resistance gained when the heel strikes the moving treadmill. This makes aquatic exercise even safer for rehabilitating injuries and for older and/or poorly conditioned individuals. The PAT 201 is recommended for the individual who is a relative newcomer to the fitness environment, recovering from injury, or seeking to maintain a steady level of fitness, flexibility and activity. The PAT 302 is designed for the individual who is highly active in physical training. The 302 provides a baseline resistance which is at the upper level of the 201, but allows the individual to exert sustained high energy output while permitting the intermittent bursts of effort followed by recovery, emulating speedwork, which are necessary to produce superior performance. Length: 38", Height (with handrail): 46", Width: 26", Weight: 66 lbs. The compact Underwater Treadmill adds a whole new dimension of fun and fitness to any home exercise or rehabilitative program by allowing you to walk or run in a weight-free environment against the natural smooth resistance that only water can provide. This revolutionary, low-cost, aquatic underwater treadmill fits into any size or existing pool, and its modern, lightweight design allows for quick and easy insertion and removal. The Underwater Treadmill is also self-propelled and features progressive resistance combined with user-control and unmatched stability and performance - making it perfect for your conditioning or therapeutic purposes. The compact Underwater Treadmill is the perfect addition to any training facility. This aquatic treadmill adds a whole new dimension to any training or rehabilitative program by allowing athletes to walk or run in a weight-free environment against the natural smooth resistance that only water can provide. The revolutionary, low-cost, Underwater Treadmill fits into any size existing pool, and its modern, lightweight design allows for quick and easy insertion and removal. The Underwater Treadmill is also self-propelled and features progressive resistance combined with user control and unmatched stability and performance. Get your athletes ready for competition or back in the game quickly and safely. The compact Underwater Treadmill is the perfect addition to any rehabilitation facility. 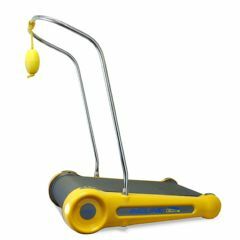 This aquatic treadmill adds a whole new dimension to any training or rehabilitative program by allowing patients to walk or run in a weight reduced environment against the natural smooth resistance that only water can provide. This revolutionary, low-cost underwater treadmill fits into any size existing pool, and its modern, lightweight design allows for quick and easy insertion and removal. The Underwater Treadmill is also self-propelled and features progressive resistance combined with user-control and unmatched stability and performance. Get your patients back on their feet quickly and safely with the Underwater Treadmill. Take your health club to a whole new level and make it more attractive to prospective members by introducing the innovative and technologically advanced Underwater Treadmill to your facility. This unit adds a whole new dimension to any club - giving members an alternative and fun means of pursuing their fitness goals. Plus, the Underwater Treadmill gives you the opportunity to create an additional source of income by running special group classes. Flow-thru high-speed turbine dampens the walkway belt movement for safe boarding and exponentially increases resistance as the walking or running speed increases. The harder you work - the harder the Underwater Treadmill works. The unique flywheel mechanism keeps the treadmill moving for low impact, continuous walking or running. Double Side Platform: Position the Underwater Treadmill roller side up and you can enjoy a foot massage while taking a leisurely stroll. Flip the platform over, and the baseline resistance increases for a more intense workout. The stainless steel handrail can be removed for swimming, inverting the platform, servicing, shipping and storage. Large rounded corners and soft molded feet protect your toes, hold the Underwater Treadmill in place and keep the interior of your pool in great shape. Highly reflective chrome and bright yellow color let everyone know the Underwater Treadmill means business. IS THERE A PREVENTIVE MAINTENANCE PROCEDURE FOR THIS LITTLE T-MILL? Asked on Jul 19, 2012 12:29:31 PM by CHARLES from GA.
We are purchasing a Coast Wellness Spa. It measures 8' X 8'. How narrow is the base of this treadmill. Would it fit in our spa.